J.D Power has conducted the Initial Quality Study (IQS) for more than 30 years, surveying owners of new vehicles who have had them for at least 90 days. The benchmark study measures what has gone right and what has gone wrong with the vehicles in order to learn more about design and defect problems. To summarize the study’s findings for consumers seeking guidance about which new vehicles might best serve their needs, J.D. Power generates Power Circle Ratings based on the information it receives from new-vehicle owners. These ratings represent the data in a simple, visual way, making them easy for new-vehicle researchers to use. This buyer’s guide contains the top-rated 2018 Family SUVs for Initial Quality. Each model earned a Power Circle Rating of 4 or 5 out of a possible 5 for initial quality during the first 90 days of ownership. Chevrolet’s largest crossover SUV, the Traverse, is completely redesigned for 2018. Six trim levels are available, most powered by a 3.6-liter V6 engine. A turbocharged 2.0-liter 4-cylinder engine is standard with RS trim, which cannot be optioned with all-wheel drive like other versions of the SUV. The Traverse continues to be one of the roomiest models in its segment. The 2018 Chevrolet Traverse receives an Initial Quality Power Circle Rating of 4 out of 5. The Edge is a midsize 5-passenger SUV. A turbocharged 4-cylinder is standard, with a V6 and a twin-turbocharged V6 available, depending on which of the four trim levels you choose. Front-wheel drive is standard, with all-wheel-drive optional. The exception is the twin-turbo Sport, which has AWD as standard equipment. For 2018, a new Safe and Smart Package debuts, as well as an SEL Sport Appearance Package. The 2018 Ford Edge receives an Initial Quality Power Circle Rating of 4 out of 5. Ford’s 3-row, 7-passenger crossover SUV is the Explorer. A V6 engine is standard, powering the front or all four wheels. Upgrades include a turbocharged 2.0-liter 4-cylinder and, in both Sport and Platinum trim, a twin-turbocharged 3.5-liter V6. Ford makes minor changes to the 2018 Explorer’s styling, while adding a new 4G Wi-Fi hotspot and a Safe and Sound option package. The 2018 Ford Explorer receives an Initial Quality Power Circle Rating of 4 out of 5. Completely redesigned for 2018, the full-size Ford Expedition comes in standard and extended-length body styles, offering roomy accommodations for up to eight people. A twin-turbocharged V6 engine powers all variants, which include XLT, Limited, and Platinum trim. Rear-wheel drive is standard, with 4-wheel drive available as an option. Expeditions carry more cargo and tow more weight than primary competitors do. 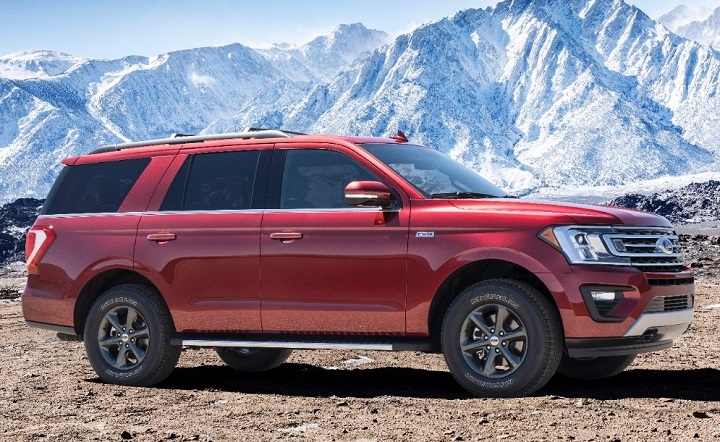 The 2018 Ford Expedition receives an Initial Quality Power Circle Rating of 5 out of 5 and receives a quality award in the Large SUV segment. GMC’s full-size SUV is offered in standard and extended-length body styles, and with a choice between SLE, SLT, and Denali trim. Two V8 engines are available, powering the rear or all four wheels. This year, the 2018 Yukon Denali version’s 6.2-liter V8 is paired with a new 10-speed automatic transmission, a Denali Ultimate Black Edition is available, and real wood trim is added to Denali trim. The 2018 GMC Yukon receives an Initial Quality Power Circle Rating of 4 out of 5. Two versions of the Santa Fe are on sale. The shorter Sport holds five people, while the standard Santa Fe can carry seven people. The Santa Fe has a V6 engine, while the Santa Fe Sport employs a 4-cylinder or a turbocharged 4-cylinder. All are front-wheel drive, with all-wheel drive optional. Hyundai makes minor changes for 2018, most notably free inclusion of its Blue Link services package for three years. The 2018 Hyundai Santa Fe receives an Initial Quality Power Circle Rating of 4 out of 5. Able to hold five or seven people, depending on whether it is equipped with a third-row seat, the Kia Sorento is offered with a 4-cylinder, a turbocharged 4-cylinder, or a V6 engine. All-wheel drive is available. Trim levels include L, LX, EX, SX, and SX Limited, the latter featuring downright luxurious accommodations. Kia makes few changes to the 2018 Sorento, which receives a more substantial update for 2019. The 2018 Kia Sorento receives an Initial Quality Power Circle Rating of 5 out of 5 and receives a quality award in the Midsize SUV segment. Nissan’s 5-passenger crossover SUV returns for 2018 in S, SV, SL, Midnight Edition, and Platinum trim levels. It has a 3.5-liter V6 engine and a continuously variable transmission, with front-wheel or all-wheel drive. This year, Nissan adds forward collision warning and automatic emergency braking as standard equipment, enhances the list of included features for most trims, and revises the Murano’s center console design. The 2018 Nissan Murano receives an Initial Quality Power Circle Rating of 4 out of 5. A rugged midsize SUV with seating for up to seven people, the Toyota 4Runner is designed and engineered to go places few vehicles dare tread. Aside from fresh paint colors, nothing changes for 2018. That means it still has a 4.0-liter V6 powering the rear or all four wheels, and continues in SR5, TRD Off-Road, TRD Pro, and Limited trim levels. The 2018 Toyota 4Runner receives an Initial Quality Power Circle Rating of 4 out of 5.